The CPGB-ML and the anti-imperialist magazine LALKAR express their deep sorrow at the passing away of comrade Yasser Arafat, without a doubt one of the greatest anti-imperialist fighters of our time, and the most representative spokesman of the Palestinian people for over 40 years. Arafat has been involved in every significant event in the history of the movement for Palestinian liberation since the late 1950s. He and others founded Fatah in 1957 in order, at first, to initiate and co-ordinate small military attacks against Israel with a view to re-igniting the spirit of the Palestinian people and keeping alive the ‘Palestinian issue’. In 1968 he led the fighters of the Karameh refugee camp in Jordan to one of the most incredible and unlikely victories in modern history, as they successfully fought off an Israeli invasion by thousands of well-equipped Israeli troops. In 1982 under his leadership, the PLO and its Lebanese allies single-handedly faced for two and a half months, the full might of the Israeli army of aggression - 150,000 strong and armed to the teeth by US imperialism with the most sophisticated weaponry - and prevented it from overrunning West Beirut. The valour, the heroism and the steadfastness of the PLO fighters redeemed the honour of the entire Arab people, established the PLO as the sole legitimate representative of the Palestinian People, and proved the invincibility of their struggle for national liberation. These were the superb achievements of the people of Palestine under Arafat’s leadership. Arafat’s extraordinary devotion and selflessness is well-documented. His life as a revolutionary was well underway by the age of 17, by which time (1947) he was smuggling weapons from Egypt to help the Palestinian resistance. In 1948 he moved from Cairo to Gaza to fight in the Palestinian resistance. In the 1950s he was a respected student leader in Egypt, and by 1964, the year in which Fatah started its military operations, he had given up a lucrative career in order to become a full-time revolutionary. The guerrilla warfare against Israel saw Arafat and his comrades imprisoned many a time by the Arab regimes and he survived scores of assassination attempts by Mossad. Having initially led from exile, moving his HQ from Egypt to Kuwait, Syria, Jordan, Lebanon, Libya and Tunisia as the situation demanded, he was able after the first intifada to repatriate the struggle to Palestine where for the last three years of his life, he was effectively under house arrest in the PLO compound in Ramallah. Arafat was among the first to realise that the Palestinians could in no way rely on the corrupt lackey Arab regimes, and that Palestinian liberation would have to be led by the Palestinians themselves. In 1969, Fatah gained control of the Palestinian Liberation Organisation, which had been set up in 1964 by the Arab states as a sop and a talking shop. Under Fatah’s leadership, with Arafat as chairman, the PLO was able to unite the various disparate groups working for Palestinian national liberation into a single umbrella organisation, and this has been one of the keys to the success of the Palestinian struggle and its ability to operate independently from the reactionary Arab regimes. Without a doubt, maintaining the unity of the PLO for 35 years, in spite of the innumerable attempts by both Israel and the Arab regimes to break it up, was an incredibly difficult task, and one which was successfully undertaken by Arafat. 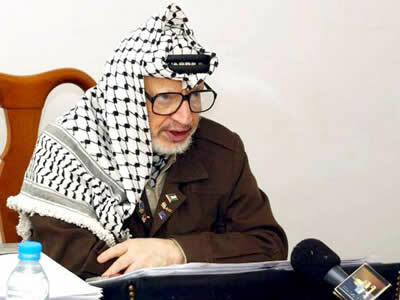 Arafat’s death is a terrible loss to the Palestinian people and their struggle for national liberation. He more than anyone was responsible for transforming the desperation and desolation of the Palestinian people after the brutal seizure of their homeland by the Israeli fascists (with their British guns) into a vibrant, heroic political and military struggle for a Palestinian state. Once that state is created – as it inevitably will be – he will rightly be considered its father. His devotion, courage, self-sacrifice, military genius, tactical flexibility and extraordinary political skill have served the Palestinian people in the most profound way. Grief at comrade Arafat’s death is not felt by the Arab masses alone – he will be mourned in all corners of the globe, by all people who suffer the ignominies of monopoly capital, and by all people who struggle against this decadent, moribund system that subjects billions of people to poverty, starvation, exploitation, oppression, repression and humiliation. For imperialism is an international phenomenon. It does not discriminate on the basis of skin colour or nationality – it will exploit anyone. Therefore every struggle against imperialism is a struggle on behalf of all those who are fighting imperialism. One of Arafat’s greatest assets as a leader was his ability to be flexible with regard to tactics, and appreciate the need for different approaches in different historical contexts. Signing the Oslo accords, so vehemently condemned by the fake left in the imperialist countries, is just one example of his ability to find his way out of an apparently hopeless situation. Israeli Zionism and US imperialism tried their best to isolate Arafat, but the more they tried the more they failed, for Arafat was loved by the people of Palestine. They rightly regarded him as a symbol of all their hopes and aspirations. Undoubtedly there will be much gloating and malicious glee in the camp of Zionism and imperialism at the passing away of Yasser Arafat, but this glee will be short lived. The Palestinian people through the intensification of their national liberation struggle will deliver a crushing blow to Zionism and its backers.